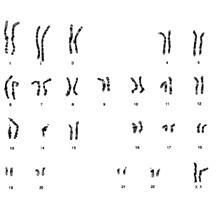 A Robertsonian translocation of chromosomes 13 and 14, an end to end fusion of the two chromosomes, is seen here in a balanced rearrangement. There is no net gain or loss of genetic material in this person so they would have a normal phenotype. Their risk, however, for an abnormal child or spontaneous pregnancy loss is increased.